Last night a Houston Police Department patrol officer had pulled over a suspected drunk driver and was conducting an investigation when the officer’s patrol car was smashed by a second suspected drunk driver. 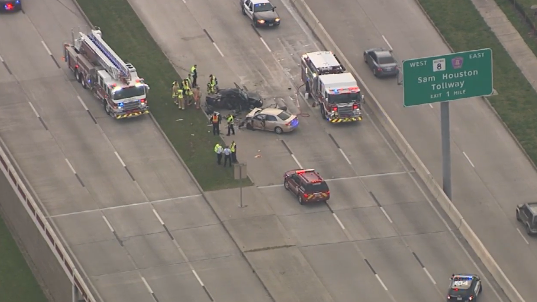 This is not a rare occurrence in Houston, and for some reason rather than emergency lights serving as a warning to drunk drivers, the lights seem to draw them in like moths to a flame. The crash happened on Houston’s North Loop (coincidentally Smith & Hassler’s office is on the North Loop). 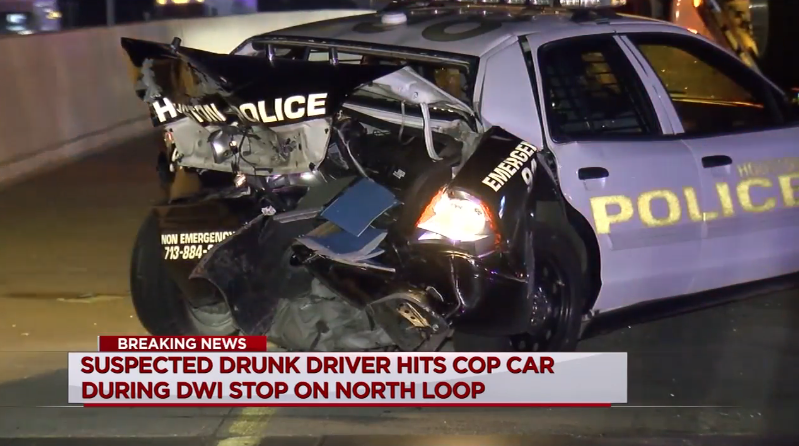 The officer and suspected drunk driver #1 were reported to be uninjured thankfully, and ABC Channel 13 has video of both drivers being sobriety tested. If you’ve been hurt by a drunk driver, in Houston or anywhere else, give us a call and we’d be glad to explain what your legal options are. 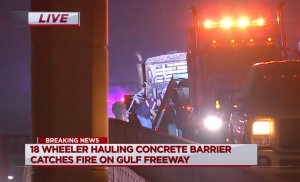 The inbound Gulf Freeway was closed this morning after a collision involving an 18-wheeler and a pickup truck. The 18-wheeler was hauling concrete barriers when the driver noticed the big rig was starting to catch fire. He attempted to pull over onto the shoulder, but when he did, struck a pickup truck parked in the shoulder lane. The 18-wheeler then traveled an additional 1/4 mile or so according to Channel 13, before it stopped and was engulfed by flames. The injured driver of the pickup truck was taken to Clear Lake Regional Medical Center. 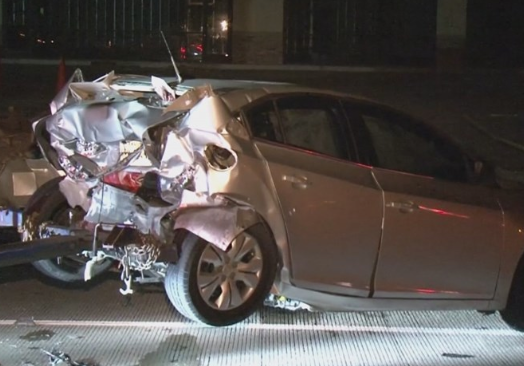 A pickup truck driver somehow ended up driving into oncoming traffic on the Hardy Toll Road in Houston last night, eventually crashing head-on into a tow truck. 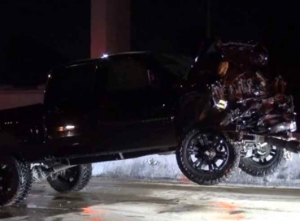 The pickup was driving northbound in the southbound lanes, the crash happened right around midnight. Fortunately both drivers are injured but expected to survive. According to witnesses a serious accident was caused by a pickup truck that ran a red light on FM 2920. A male driver and female passenger were heading southbound on Meadowhill traveling approximately 50-60 MPH when the pickup collided with a Chevy Tahoe SUV traveling on FM 2920. The female passenger in the pickup was taken to hospital in critical condition and two occupants in the SUV were also transported to the hospital. Two drivers were hospitalized after a major crash on US-90 in Missouri City on Thursday March 3, 2016. A man in his 20’s driving a Toyota Corolla crossed the grassy median and collided with a Toyota Camry heading in the opposite direction. 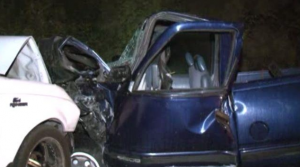 This accident has indications of being caused by distracted driving. 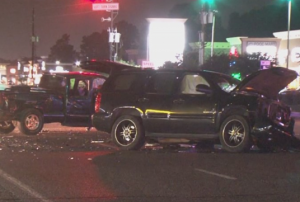 Two men were seriously injured when a 22-year old suspected drunk driver lost control of his pickup, crashing head-on into another pickup truck on Tidwell Road in Houston. The crash happened around 3:30 a.m. Saturday; Houston Fire Department had to use the jaws of life to free the injured men whose vehicle was hit by the alleged drunk. Both victims were transported to Memorial Hermann Hospital but were expected to survive. The Smith & Hassler Law Firm headquartered in Houston, Texas was formed in 1989 and has recovered millions of dollars for victims of drunk driving. Smith & Hassler is 100% dedicated to personal injury matters and the majority of the firm’s attorneys are Board Certified in Personal Injury Trial Law by the Texas Board of Legal Specialization. An umbrella insurance policy provides an additional layer of coverage above the coverage provided by an automobile insurance policy. An automobile insurance policy has three “pots” of coverage: (1) a per individual coverage limit for bodily injury or death; (2) a per accident coverage limit for bodily injury or death caused to more than one person; and (3) a per accident property damage coverage limit. In the State of Texas all non-commercial drivers are required to carry a minimum of $30,000 per person for bodily injury, $60,000 per accident for bodily injury, and $25,000 per accident for property damage. See Texas Transportation Code Sec. 601.072. This is often referred to as a minimum limits policy, or a 30/60/25 policy. Anyone who has ever had any significant medical treatment will appreciate that $30,000 will not go very far given how expensive medical care is nowadays: you could easily spend twice that amount on a simple surgery for a broken wrist or arm. So someone with what would be considered a lot of car insurance may have up to $250,000 of coverage for bodily injury/death caused to one person. That sounds like a lot, and compared to what the average person carries it is a lot, but if the person insured under the policy causes a fatal accident or injures someone so severely they may not be able to work again, $250,000 is a drop in the ocean. An umbrella policy typically provides an additional $1,000,000 of coverage above and beyond the coverage on an automobile policy. Relative to the cost of the primary automobile policy, umbrella policies are typically not too expensive. Depending on the demographics of the person buying the policy and their driving record, a $1MM umbrella may only cost a couple of hundred dollars for a year’s worth of coverage. Having an umbrella policy will serve two important purposes: it will protect the assets and property of the person covered under the policy should they cause an accident resulting in very serious injury or death. It will also ensure that in the event of such an accident, the injured person or their family is more likely to be adequately compensated and the claim settled within the insurance policy limit. A woman walking home from a shopping trip was hit by a car near North Loop 336 in Conroe and is in critical condition. Conroe Police Department say they started getting calls about an automobile versus pedestrian accident around 10:30 p.m., and shortly later a woman came in to the police department to say she thought she had hit someone walking off North Loop 336 near Longmire. Police came to the scene to find a woman in her mid-20’s in the roadway with groceries strewn on the road. The injured pedestrian had been walking with a cart full of groceries in an unlit area of the roadway not protected by a crosswalk. She was flown by helicopter to Memorial Hermann in Houston. No charges were expected to be filed in connection with the accident.